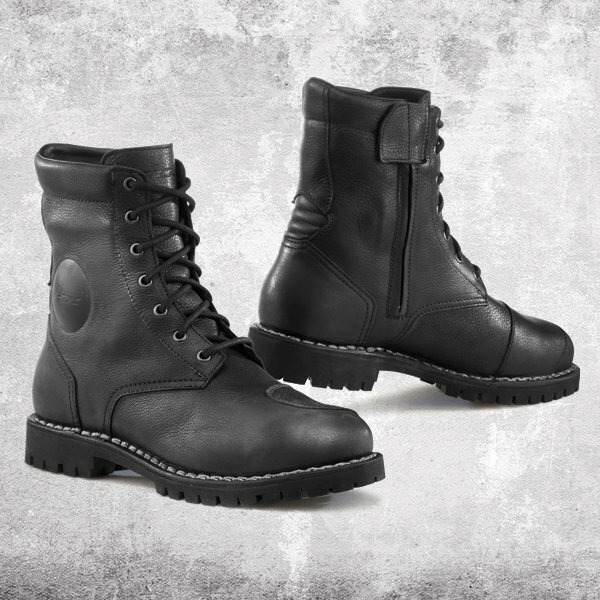 One of the most popular short motorcycle boots of the last 12 months has been TCX’s Hero boot. It looks just right, and ticks all the boxes. It’s made from leather, has protectors where you want them, an all-terrain sole with a toughened shank, a waterproof membrane and a full-length zip. But until this week, it had only been available in brown. Well now there’s a new improved version of the boot, and it’s available in black. It’s an improved version because not only does this boot have a waterproof membrane, that membrane is produced by Gore-Tex. Gore-Tex, in the eyes of most people, produce a superior membrane. It is more watertight than your average membrane, and certainly more breathable than most. That’s why, at £219.99, this new boot costs a bit more than the brown version. But it’s a great boot. It’s as comfortable as any bike boot you’ll ever slip your foot into. Yet it’s still protective and hardwearing. They’re in stock now. 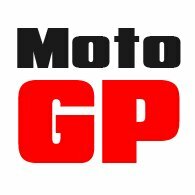 15% off many major motorcycle clothing and helmet brands. But only until November 17th! The Motocycle Live show at the NEC is fast approaching. And although it can’t compare to the EICMA show at Milan that we visited this week, Birmingham will still host a number of new 2018 bikes. The show has also become a place to visit to pick up cheap gear. And the usual ‘pile-it-high’ brands will be out in full force. Of course, real bargains are few and far between. The most prestigious brands simply don’t allow their wares to be sold at the NEC. And the lowest prices are usually reserved for discontinued styles that have been replaced by new models or styles. But this doesn’t stop some people from thinking that they’ll get a deal at the show. Which is why, between now and the first day of NEC Live, we’re offering 15% off the kinds of brands that you may find at the NEC. The only difference is that our offer applies to all the styles offered by those brands, in all sizes. So take a look on the website. 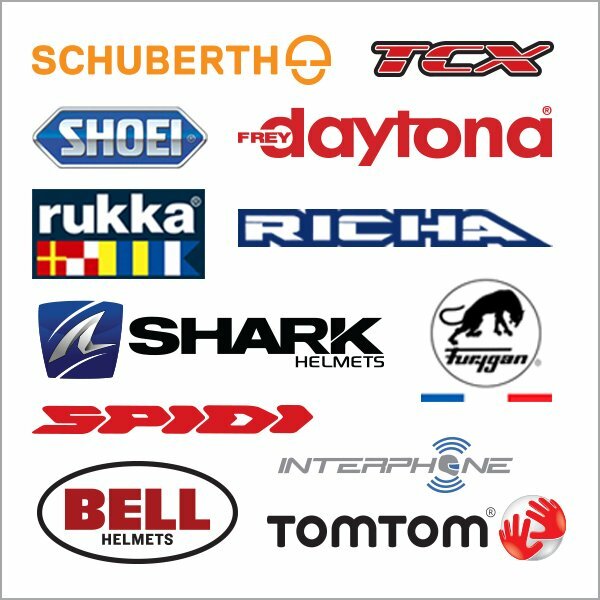 If there’s anything you fancy from Schuberth, TCX, Shoei, Daytona, Interphone, Richa, Rukka, Shark, Furygan, TomTom, Spidi or Bell, go for it. But be quick; the clock is ticking. See the website for details, and how to use the NEC17 promotion code. You may already know all about Rokker’s amazing, single-layer Rokkertech jeans. They feel and wear like a high street jean, yet they have an all-over slide time of 5.8 seconds, which makes them significantly stronger than leather. 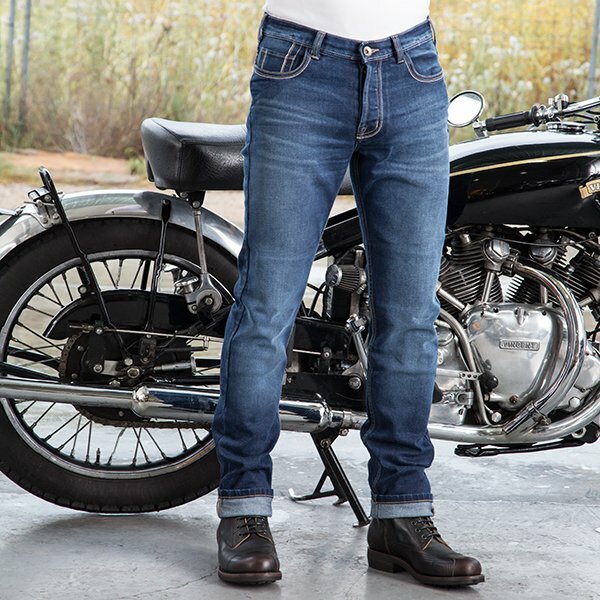 They come with pockets to take D30 armour, so they really are jeans you can wear with confidence on the bike. But until now we haven’t had much stock of the smaller waist sizes. Well that’s been put right this week so, right now, we have them available in the following waist sizes: 31”, 32”, 33”, 34”, 36”, 38”, 40” and 42”. And in 32”, 34” and 36” leg lengths. They don’t, unfortunately, come in a 30” leg length, which will disappoint those who are marginally deficient in this particular department. The 32” leg length can easily be shortened, and we will do this for free, but if we do this, because the armour pocket is fixed and not adjustable, you may well end up with armour that is not in the right place for your knees. It will probably be too low. The other thing you need to know about the Rokkertechs is that they have a pretty narrow fit. It is sometimes possible to get the jeans over a tall boot, but they are really better suited to the wearing of a short boot. The best thing is to try a pair on, and there's nowhere better to do this than here in Guildford, because we're the only people in the country to always hold stock of them in all sizes. Of course, you can just order online, but it might take a couple of tries to get it right. All we can say is that you do need to persevere; they're game changing. 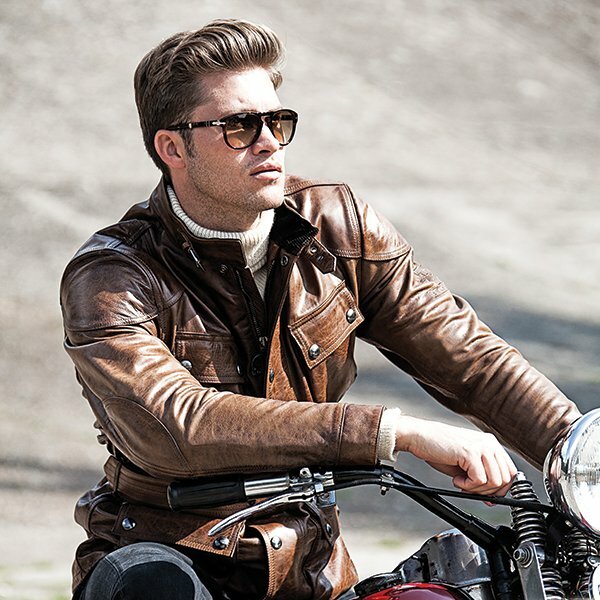 We love Helstons’ leather jackets. We don’t think anybody does it better. They select the finest leathers, and then treat them with their own formula of oils and waxes to make them soft and supple. They’re also the masters when it comes to creating subtle patination. Other makers try to copy Helstons, but make a hash of it, with end results that simply look horribly faux. When Helstons creates a vintage effect, it just looks right. All their jackets come fully armoured with elbow, shoulder and back protectors. Most have a thermal liner. Likewise a waterproof membrane. It is, in our experience, important to get the fit just right, and we advise getting the fit tight without the liner in place. In a matter of months, the jacket will loosen up and allow the liner to be worn back in the jacket with ease. New styles just in are the Reno, the Rusty and the Gang. We’ve also got a couple of new textile jackets, and some brilliant gloves that go under the name of Tornado. Visit the site for more details. We’ve never done heated clothing before, even though we quite liked the idea of it. We’ve always heard stories about problems as far as reliability is concerned. And the jackets we looked at were simply too bulky, heavy and cumbersome to wear underneath a nice jacket. But we started hearing about an American brand called ‘Warm and Safe’. Some of our customers raved about it. We did our research, and most people in the house confirmed that whilst it wasn’t the cheapest, it is the best. 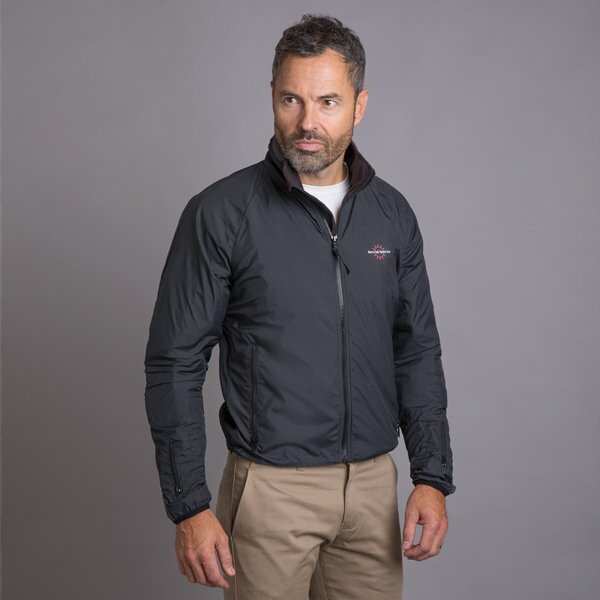 The jacket is incredibly thin, but with its carbon filaments it delivers terrific, all-over heat, even in the neck. Using a special, flexible soldering technique allows Warm and Safe to create connections that don’t break. This, apparently, is the weak point on most heated clothing. For now we’ve taken on the jackets and glove inners only. We’ve tested them, and they have changed our view on winter riding. No longer does the cold hold any fears for us, and it’s got to be transformatorial for winter commuting. We suggest you do some homework. Then take the plunge. You will be amazed. It’s that time of year. As the new winter collections turn up from the manufacturers, they tend to be accompanied by across-the-board price rises. Of course, some are blaming Brexit and the weakness of the pound, but the fact is that very few brands will be holding their prices for 2018. 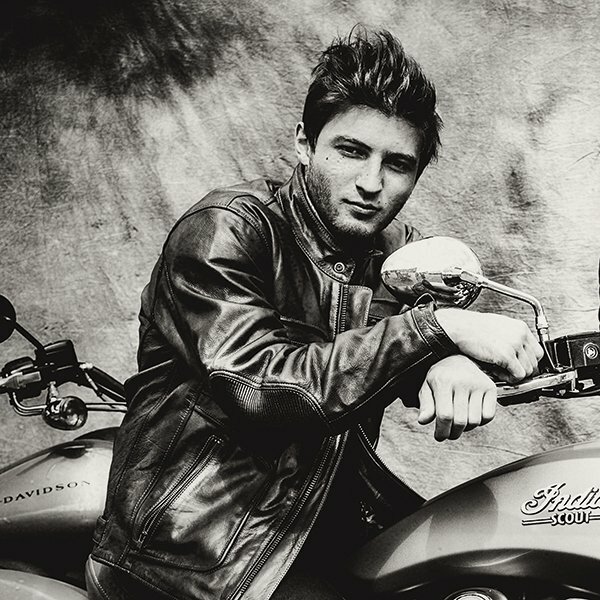 And Belstaff is no excpetion. Their prices for all their jackets will increase; some as little as 5%; others as much as 20%. Now because we’re stand-up guys, we will do what has been asked of us, and on Monday we will be putting up the prices on the entire range. But there are dealers out there who won’t have done so as swiftly as us in the hope, we suspect, that they will be able to undercut other retailers. Well so be it. But in such circumstances our 10% Price Beat guarantee will, of course, apply. In essence, if you can find a dealer that hasn’t increased its prices, we’ll beat their prices by 10%. So, as we see it, there’s a small window in which to grab yourself a bit of a bargain. But be quick, it won’t be too long before everybody has put the prices up to the new level. Minutes before we were about to go to press with this week’s ‘What’s New Pussycat’ bulletin, Lee Parks' new Sumo glove turned up, so we thought we’d hold the presses. Their new glove is a corker. Cheap it is not, but it is rather special. It’s based on Lee’s amazing summer weight deerskin glove. 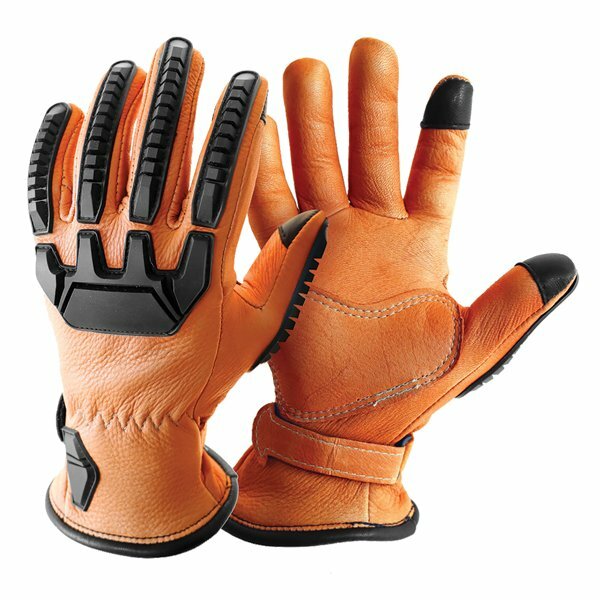 Deerskin is the best leather for a glove. It’s four times stronger than cowhide, yet still amazingly soft. Nothing wears like a deerskin glove; they get nicer with age. No self-respecting cowboy would have worn anything else. The only problem with Lee’s gloves is that for some people they don’t look like bike gloves. Well with the Sumo, he’s put that right with an aggressive looking set of knuckle and finger protectors that have more than a touch of the desert racer about them. The TPU protectors add the impact protection that some felt were missing. You’ve now got a glove that offers the best of everything. Amazing abrasion resistance. A design that reduces seams to the minimum. And passive protectors that will protect your hands against impact. We love them. They’re perfect for any scrambler or custom off-road bike. You get aggressive, Mad-Max styling, but with a comfort level most glove makers can only dream about.